The Original Pawleys Island Rope Hammock is anything but new-fangled. At nearly 125 years old and counting, the venerable brand continues to offer the very best of its past toward helping its customers better enjoy their own futures. The Pawleys story begins in 1889, with young South Carolina riverboat captain Joshua “Cap’n Josh” Ward, who was then having a tough time getting a good night’s sleep. Cap’n Josh ferried rice and other cargo from his state’s inland plantations to port in coastal Georgetown, just north of his home in the popular resort town of Pawleys Island. So he spent a lot of nights out on the water, and the grass-filled mattresses common on working boats back then only amplified the steamy summer heat. Out of desperation, Cap’n Josh figured he’d give sleeping in a hammock a try, though the most common hammocks in his day were the fabric variety found on commercial and military ships, and didn’t offer much by way of improvement. Those maritime hammocks were small, hard to get into, cramped and prone to tipping. And because they were also made out of canvas, they felt rough, and were hot – sweaty hot. Cap’n Josh thus turned his attentions to rope hammocks, figuring they’d have to allow for cooler sleeping. Unfortunately, the rope hammocks of his time were made from poor-quality hemp or manila rope, feeling like sandpaper against the skin. Not to mention they weren’t really all that sturdy, and had bulky, uncomfortable knots tied throughout. So Cap’n Josh set out to create his own rope hammock, with his sites set on comfort instead. 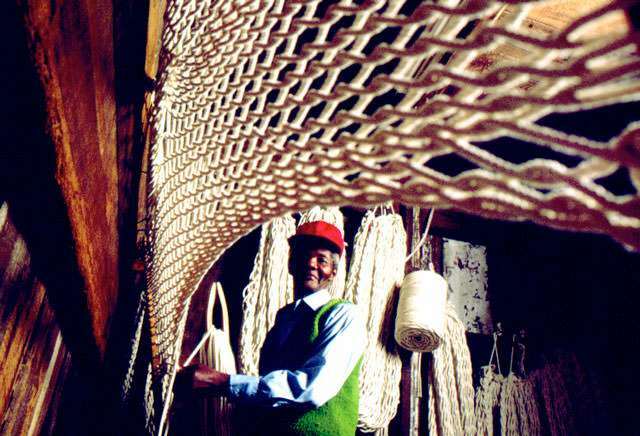 He began with heavy cotton rope, and then, rather than tying his ropes together in knots, he used a double-latch weave, where individual ropes pull against each other to produce a lattice-like design. However, Cap’n Josh’s greatest contribution to the art of hammock-making has to be the spreader bar. He took slats from wooden oak storage barrels and sawed them to his selected size, boring holes in them at equal distances apart. He then threaded the holes with the rope ends from a standard mariner’s clew knot (the pretty triangular knot found at both ends of most hammocks), tying each threaded rope to a looped end of his woven hammock bed. This way, the only knots were away from the hammock bed itself. The two spreader bars held the hammock bed wide, the cotton and the lack of knots made it soft and comfy, and the heavy rope and double-latch weave kept it strong and secure. 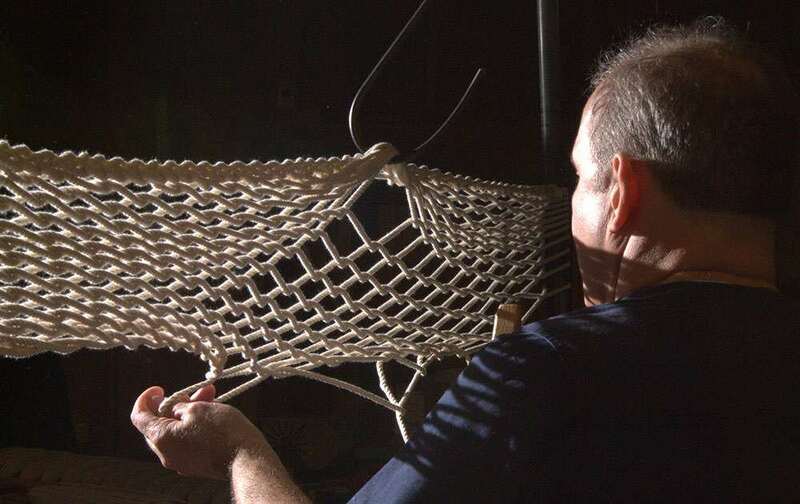 In the many years since, the Original Pawleys Island Rope Hammock has become the standard for what we now think of as the classic American hammock style – not to mention the best-known hammock brand in history! Almost any rope hammock you see today, no matter who makes it, is based on Cap’n Josh’s original design. In fact, other than Pawleys Island Hammocks undergoing some improvements to materials (all-weather, cottony-soft synthetic ropes and fabrics, for instance, in addition to classic cotton rope), the basic design of a Pawleys hammock remains little different from way back in 1889, when Cap’n Josh first hit upon his winning hammock formula! Which explains why “Original” is such a prominent part of The Pawleys Island brand name – because the Original Pawleys Island Rope Hammock is just that: the original. DuraCord® Rope: Solution-dyed synthetic blend rope that balances the softness of cotton with the durability of polyester. This combination makes the rope All-Weather proof and resistant to rot, mold, and mildew. .
Oak Frame: Oak is naturally resistant to rot and insect infestation. The frame pieces are repeatedly hand-dipped in honey-gold marine-grade varnish for exceptional look and longer outdoor life. Eco-Friendly Durawood: Durawood is a 3/4"-1" lumber, compared to 1/2" thick offered by our competitors, that's made from densely compressed recycled plastic milk jugs and soda bottles. It contains no waste-wood fiber so it won’t absorb any water and won’t rot, splinter or crack. Durawood is fade resistant and will never require paint, stain or any kind of sealant. Oak Spreader Bar: Oak is naturally resistant to rot and insect infestation. The spreader bar is repeatedly hand-dipped in honey-gold marine-grade varnish for exceptional look and longer outdoor life.